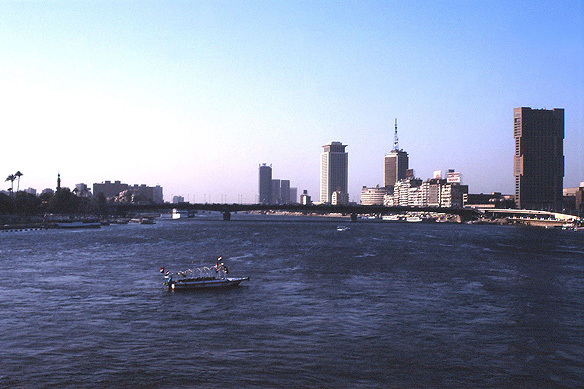 Cairo’s most famous and priceless treasure is the Egyptian Museum in the heart of the city. Founded by the French archaeologist Auguste Mariette in 1858, it contains some of the world’s most extraordinary antiques. At least two days are needed to get a grasp of the masterpieces which range from across the millennia: the Old Kingdom (2686-2160 BC), Middle Kingdom (2040-1640 BC), New Kingdom (1550-1080 BC), the Amarna Period and the subsequent Ptolemaic and Roman periods. Highlights of the Museum are the Narmer Palette which records the unification of Upper [valley] and Lower [delta] Egypt by King Narmer in 3100 BC and marked the beginning of Egyptian art and history. Among Old Kingdom masterpieces are the effigies of King Djoser (3rd Dynasty) the first pyramid builder at Saqqara, King Khafre protected by Horus (4th Dynasty) and the family group sculpture of the dwarf Seneb. Ushebtis (small tomb figures), scarabs, painted linen cloth, headrests and papyri from the Book of the Dead are some of the many interesting artefacts from the New Kingdom tombs. Dating back to the Ptolemaic period is the famous Rosetta Stone which helped the linguist J.F. Champollion unlock the secret of the hieroglyphics—the ancient Egyptian script that covered the walls of their monuments and papyrus rolls, recording historical events, biographies and prayers. Once the script was uncoded, an entire world was revealed waiting to be read and understood. The Egyptian script consisted of about 700 hieroglyphs. Of these, at least 100 were purely ideograms (symbols standing for an idea) whilst the rest were phonograms (symbols standing for sounds). Conceived and developed around 3100 BC, the hieroglyphs were perfect for incision on stone. Two other scripts, more flowing and cursive, were developed for writing on papyrus. These were the hieratic or priestly script (as old as the hieroglyphics) and the demotic or popular script for secular purposes, the latter developed around 700 BC. The Tutankhamen Collection of 1,700 objects found in the tomb of the boy-king Tutankhamen by Howard Carter in November 1922 is overwhelming, to say the least. Son-in-law of the beautiful Queen Nefertiti, Tutankhamen was merely 10 years old and married to Ankhesenamen, a girl of 12, when his reign began in 1361 BC. He died at the young age of 19. Each object from the tomb is exquisite and even the smallest artefacts are skilfully executed. The gilded shrines, gold coffins and golden funerary mask inlaid with semi-precious stones are spectacular. Also on display are his jewellery, sandals, socks, perfume jars, funerary furniture, games, chariots, hunting bows and arrows, the canopic jars containing his viscera, and the two statues of his ka, soul, which guarded his tomb for over 3,000 years. The Mummy Room (additional fee) opened in 1994 and contains the mummies of some of the greatest rulers of Ancient Egypt. They were found in a cache in Deir el-Bahri (Luxor) in 1875 and include the mummies of the great 18th Dynasty pharaohs of Amenhotep I, Thutmose IV, Seti I, and Ramses II. One of the most controversial pharaohs of Ancient Egypt was the heretic king, Akhenaten (18th Dynasty). His move from polytheism to monotheism and his declaration which banned the State religion and announced the practice of a new religion—the worship of only one god Aten—created a major stir in the rigid and unchanging Egyptian social organisation. He took authority away from the priests who had earlier performed the religious rites and controlled the reigns of Egypt’s religious and, thereby, political power. He also moved the capital from Thebes to Amarna where he built a new city called Akhetaten, the horizon of Aten, and changed his name from Amenhotep IV to Akhenaten, of service to Aten. Akhenaten not only brought about a change in religion but also in art. He revolted against the rigid stiff style, moving to one more natural and closer to realism. Sculpture, painting and reliefs commissioned in the new capital followed this new style. Akhenaten himself was portrayed as skinny and pot-bellied with a narrow head and bony arms. A masterpiece that has come down from those years is the limestone bust of his wife Nefertiti, ‘beauty that has come amongst us’, which is at the Egyptian Museum in Berlin. Four massive statues of Akhenaten, a stele showing him and Nefertiti playing with their children, and the painted floor from his palace at Tel el-Amarna reflect the revolution in art, politics and religion that he brought about which lasted only during his lifetime. When he died the old State religion was brought back with a vengeance by the priests who also destroyed and erased his name, monuments and city, in the hope of wiping out his very existence from history. Akhenaten’s style of art, however, lived on through the treasures in Tutankhamen’s tomb; the same realism and human affection continued to be reflected in the sculptures and paintings portraying Tutankhamen and his wife Ankhesenamen. The Coptic, Egyptian Christian quarters, in Old Cairo are well worth a visit. Dating to the 5th Century, Old Cairo represents a period of Egyptian history sandwiched between the Romans and the arrival of the Arabs. It is built on the site of Babylon-in-Egypt, the fortified posts set up by the Persians and Romans. Egypt has an estimated six million Copts. The word is derived from the Greek Aigyptos, meaning an Egyptian. The Copts claim to be direct descendants of the Ancient Egyptians and have traces of that past in their language and customs. Separated from the rest of the Christian world, the Coptic Orthodox Church has stayed close to its original pharaonic rituals and themes. The architectural details of the churches, synagogues and mosques in Old Cairo illustrate many similarities. The Church of St. Sophia (5th Century) is the oldest church in the Coptic enclave and is famed for its crypt where Coptic traditions claim the Holy Family had rested after fleeing from Herod. The Hanging Church (7th Century), dedicated to the Virgin Mary, is so called because of having been built over the bastions of a Roman gate. Both churches are typical in style with 12 columns, one for each apostle. Ben Ezra Synagogue, Egypt’s oldest synagogue has been restored to its full splendour and is now a museum as most of Egypt’s Jewish community have left. This entry was posted in Egypt, Exploring our World and tagged Akhenaten, Ancient Egypt, Babylon-in-Egypt, Ben Ezra Synagogue, Coptic Cairo, Coptic Orthodox Church, Egyptian Civilization, Egyptian Hieroglyphs, Egyptian History, Egyptian Museum, Mummy Room, Narmer Palette, Old Cairo, Rosetta Stone, Things to see in Cairo, Tutankhamen Collection by Rama Arya. Bookmark the permalink.